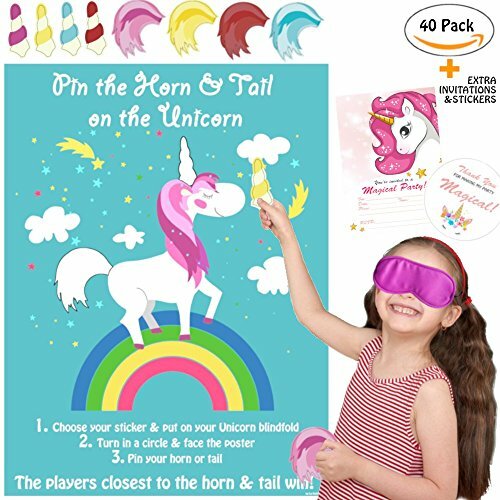 Our 2-in-1 Unicorn Pin the Horn on the Unicorn and Pin the Tail on the Unicorn Party Game for Unicorn Party Supplies promises a day full of fun and laughter! What is included in the 40x Pin the Horn & Tail on the Unicorn Game Set? - Extra 1: 12x self-adhesive circle Unicorn Thank You party stickers (1.5inches in diameter) for unicorn party favors, unicorn party decoration, unicorn envelope seals, unicorn gift bags, unicorn stickers, etc. The player(s) closest to the horn & tail win(s)! Funny party game ideas for unicorn themed parties, kids' birthday party, class parties, girls' parties, birthday parties, baby showers, etc. After the game is played, the poster can also be used as unicorn room decoration, unicorn home decoration and unicorn wall decoration if you like. Perfect gift for unicorn lovers, for both boys, girls, and adults. If you have any questions about this product by La La Unicorn, contact us by completing and submitting the form below. If you are looking for a specif part number, please include it with your message.